We know where our vehicles are in real-time. This not only helps us to keep you informed but also to monitor our transport performance. It is our belief that no customer will learn anything about the capability of a company until they have a query. In the transport and distribution industry it is commonplace for customers wanting to know where their goods are at any given time. 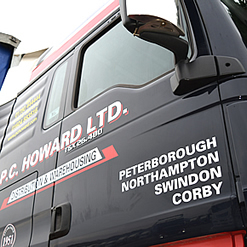 It is also important as a company that we know where our vehicles are and with knowledge that we have the flexibility to instruct our drivers whilst they are on the road. PC Howard invests in state of the art communication systems to ensure that we know where our vehicles are at any given moment. Problems can occur on our busy road network at any time. Congestion, road closures and inclement weather all potentially conspire to cause delays. But with good communications PC Howard have the capability to keep all our customers informed - our team will manage the situation and update you on a timely basis. Being able to track our vehicles in 'real time' also allows us to be able to assess the competency of our drivers. This is also part of our continual improvement plan - by monitoring driver performance we can identify areas of training to improve our services even further. All our vehicles have tracking in place - this not only enables us to monitor the vehicles movement but also to help our driver team to find the delivery point or avoid congestion on the road network- sophisticated tools to drive up our quality of service. All of our drivers have mobile phones to enable us, within the permitted rules to stay in contact with our drivers and for them to keep in contact with our team.